I recently got an apple watch, and I also have an iPhone and MacBook Air and thought I would outline why I love apple and their accessibility of all their products. After seeing the new commercials they are running showing how people with disabilities use their products in everyday life. Even better is that the people in the commercial were not being portrayed as inspirational for being able to use the products, but that they enhanced their life and they could use them like everyone else. Having a product that you can go into the store open up and have it accessible right out of the box is huge for me. I love that I can take my apple products out no matter what it is and set it up myself. I do not need to buy extra software to install on it or wait for someone else to set it up and then turn on the accessibility features for me. The level of independence that I can have with the apple products is great. I love my iPhone for all of the things that it can do to make my life more accessible. I have many apps on my phone that I use throughout the day to do daily things. I have a GPS app called Blind Square that is a great help when going somewhere new especially. I have two apps that help with finding out what things are such as a box from my pantry or even what color something is. Those two apps are TapTap See and Be My Eyes.I also have all of my social media apps on my phone so that I can interact with all of you ! I use Voice Over on my Apple products this is the built-in screen reader that comes on all of Apple’s products. It will read out whatever is on my phone screen and allow me to do everything a sighted person can do on their phone. I can send e-mails, text messages, even take photos as it will tell me how many people I have in the frame and where they are in the frame.This is available on all of their products, even the Apple Tv making it my go to because I can scroll through Netflix or iTunes to find something to watch without needing my family to read out the program guide. The Apple products that I have and use on a regular basis are MacBook Air, iPad, iPhone, iWatch, and Apple Tv. The fact that Apple has made accessibility a priority says a lot, it also shows so many other companies that it is possible and if you take the time to make products accessible you will have people who will buy them and appreciate it more than ever. Such a great post! I love apple products although I primarily use windows on the computer and have done for almost 18 years. On several occasions I’ve toyed with the idea of trying the mac operating system but although it has voiceover built in it’s much more expensive than a windows computer and I’m worried about how long it would take me to adapt to a new operating system when I’ve been so used to windows for such a long time and I feel like I have to choose between one or the other and not have both. Having said that though I feel if I do try out another operating system I’d like to have a foot in both camps so that I don’t forget windows commands but I don’t want to try the mac and give up on it. I’ve had at least 5 nokia mobile phones over the years one was a hand me down and the other 4 were brandnew 3 of those were blind friendly. I finally got an IPhone for Christmas 2012 and mum and dad had to go into the settings to set up voiceover for me as triple click home wasn’t set up by default. I did set this up later though. I’m on my second IPhone now and setting that one up wasn’t a hastle as I was in the car going to see a specialist when mum and I picked it up from the post office on the way. I turned on voiceover using Siri on the new phone but didn’t set up the new phone ready to use until the next day. I can be waiting in a waiting room somewhere or I can be somewhere out and about and I hear somebody typing out a message or an email on their IPhone or IDevice and they type at a fast speed. Last Christmas or just after my uncle came down to help clean out my grandmother’s house to get it ready to sell and he brought his IPad down with him. I happened to see the IPad sitting on the kitchen bench at mum and dad’s and I had a look at it to see what tablet it was. Low and behold my uncle said to me if you can get voiceover to work it’s yours and I thought don’t you want to play solitare on the plain home? to cut a long story short I’m learning the IPad but I’m slow at typing on a touch screen compared to using a regular keypad on a phone or computer. I have always used JAWS and with Windows getting more and more complex I’ve considered going with mac but it’s the price and if I don’t like the mac what happens about paying out all that money for a machine and an operating system that I don’t particularly like the JAWS screen reader is expensive so sometimes I’m in 2 minds whether to stick to windows or trying something different I know I’ve got podcasts to help me and that I also have the support of Vision Australia if I do need any assistance learning new blindness related things. Glad you liked the post. For future when you take a new iPhone out and turn it on if you don’t touch anything for a couple of minutes voice over will automatically come on. I’m a Mac, though I can run both. If you are seriously interested in purchasing a iMac or MacBook, do remember that the Apple will be all inclusive rather than buying a computer, Jaws, additional virus protection, etc. They are expensive either way. I’d suggest you choose the one you like best. the only thing that dows worry me if I do go down that route of considering going with mac is if I don’t like the product I’ve forked out money for something I’m not ready for or don’t like. I don’t really want to be wasting my money in that regard. I’m tempted but I worry it will be a steep learning curb but I’m sure vision Australia would be of support plus I’ve got podcasts saved just in case. As I mentioned in a comment, I’m a Mac. Steve Jobs envisioned an inclusive, user friendly system of good quality. As soon as he was able, he began making his products accessible. Vision, hearing, dexterity. If one purchases an Apple product in the store, they will set it up, turn on VoiceOver, whatever you need. I understand, but have not done this, they will do the same if ordered online and you tell them when the order is placed. Great post. 🙂 It is indeed great that Apple have put so much effort in to making their products accessible. I switched from PC to Mac a few years ago, and finally ditched my old Nokia phone for a new iPhone last year, and have been very pleased with both of them. And even non-disabled people can find the accessibility features useful as well. I’ve surprised a few people when I’ve pointed out features that they didn’t know existed but might find useful – either because they hadn’t dug that deeply, or they had avoided that area of the settings in the belief that it was just for disabled people. So it’s really worth everybody digging through those settings, as you never know what might make things easier for you. I use the Invert Colours feature most, as well as the new Magnifier feature that was added by a recent update (it uses your camera as a hand-held magnifier with some basic, useful controls). I don’t use Voiceover, but I do ask the phone to speak back things like articles occasionally if I don’t want to read them. I do intend to learn the Voiceover gestures and features though, and perhaps even blog/vlog about it as I do so, as it would be interesting and useful to learn. My mother is blind, and if we were to get her an iPhone (which we’ve talked about because it could be useful for her), I would need to be able to show her how to use it with Voiceover on. Switching from Windows to Mac is a bit of a learning curve, but I had a bit of experience from work, which helped. And I also bought the relevant books from the Missing Manuals series for my iMac and iPhone, and those books are great, as they walk you through absolutely everything bit by bit. I haven’t needed to get later books for later upgrades to the system, as I’m confident enough exploring everything on my own now. But when you’re new to things, those books are really useful, I’ve found. Ashley, I also have an IPhone and am so glad that we now live in a century filled with modern technologies that are increasingly becoming accessible to many people including those with disabilities. 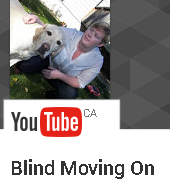 As a busy college student, I really like how I can easily surf on the web and use the internet to watch videos of successful blind people. I don’t think Hellen Keller or Laura Bridgeman would have had such access to so many resources back then. Although they were able to use many strategies to live life as much as they could, they must have been wondering if there were others like them. When I feel like I’m the only disabled person in my college campus or community, I would watch YouTube videos to let me know that there are others like me out there. That’s all thanks to the world wide web and the IPhone. I also love playing accessible games on my IPhone. It’s my favorite spare time activity when I don’t feel like doing anything serious at all for a few hours.